If you had to leave your home for good, what would you take with you? Would you take your favorite books? The scarf that your grandmother knit for you, your favorite necklace that your best friend gave you, your red shoes, most comfortable pillow, love letters, spices that you cannot find anywhere else, or more practical things like passports, identity cards, and money? Is it possible to carry your whole being if you leave a part of your life behind? Stepping in Ellen Rothenberg’s installation, ISO 6346: ineluctable immigrant, at the Spertus Institute, such questions flock together in one’s mind and do not let go of your soul for a long time. Ellen Rothenberg, ISO 6346: ineluctable immigrant (installation detail), Spertus Institute for Jewish Learning and Leadership, Chicago, 2018. Photo by: Tom Van Eynde. 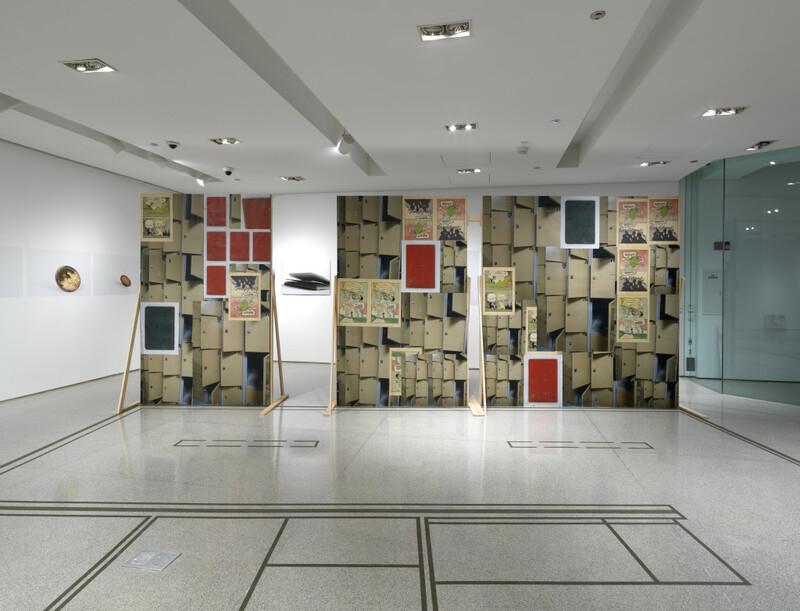 In her installation that takes up the whole gallery space, Rothenberg juxtaposes images of documents from the Spertus archive with a reference to the construction of Tempohomes, at Tempelhof, Berlin. Tempohomes is one of the largest global refugee settlements in Germany, near the Tempelhof Airport. It is a sad coincidence that this airport was once used to test some of the world’s first aircrafts and host the World War II prisoners. Today, as a vacant airport, Tempelhof area hosts people fleeing from war, poverty, political oppression, and many other troubles that come with the age of the global war and conflict. Built in early 2017 and opened later in the year, tempohomes are designed as container systems to accommodate refugees who cannot find homes due to the scarcity of housing in Berlin. For Rothenberg, in the age of global immigration, refugees are ‘ineluctable’. Every day, there are tens of people who are trying to escape from the shores of Turkey and North Africa to the countries in Europe. Some manage to reach the shores of their dream lands while many drown in the salty water of the Mediterranean. It is a struggle of life and death there. There is nothing beyond that… You either escape, or die trying. With such analogy, Rothenberg reminds the bitter history of Jewish people, who struggled for their lives, fought against racism, and worked hard to ‘start over’ in many different parts of the world. In that respect, Spertus’ archive is exclusive with the objects and documents it preserves: identity cards, immigration documents, photographs, letters, cartoons, newspaper articles, among many others. 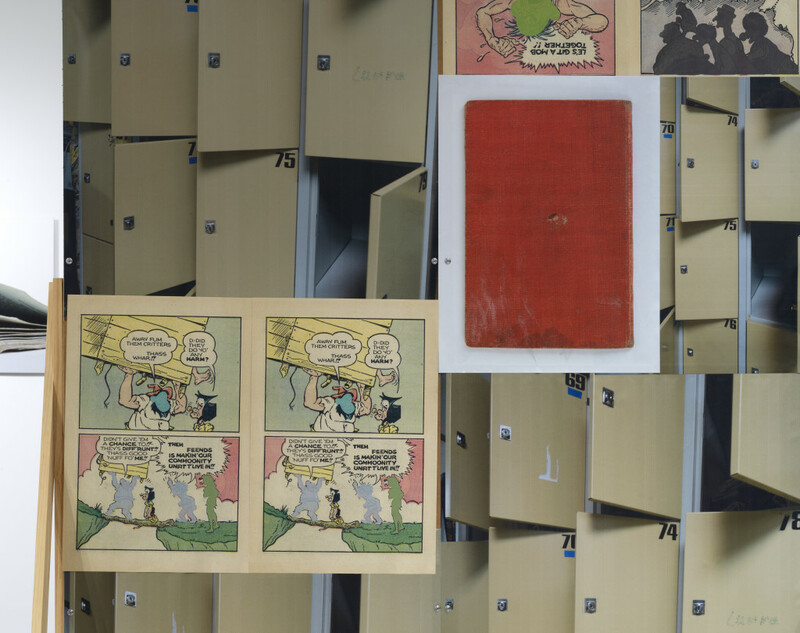 Yet, instead of displaying a selection of images and documents from Jewish history, Rothenberg picks a more abstract way to address the issue. The objects and documents are photographed in angles that distort their perception and create a distance from each historical moment. Rothenberg states that “[the] actual objects and documents speak to specific historical moments, places, and people. The installation and the images in it suggest a more generalized reading of historical continuities and reoccurring patterns that we are witnessing again today.”  Of course, such analogy does not indicate that one historical moment is equivalent to the other and every struggle is unique at its own setting. This is one of the reasons, Rothenberg prefers a more abstract way to juxtapose the construction images from Tempelhof and photographs form Spertus archive. She does not simply propose a similarity in between these temporalities, yet she leaves some gaps between these moments, lives, documents, and images, for us to reconsider, rethink, and reassess. Not only these images, but also the architectural intervention in the space mimics the tempohomes and questions the living conditions of the refugees. With green tape applied on the floors of the gallery space, Rothenberg positions the floor plans of the containers, where the refugees are temporarily living in the field of Tempelhof Airport. 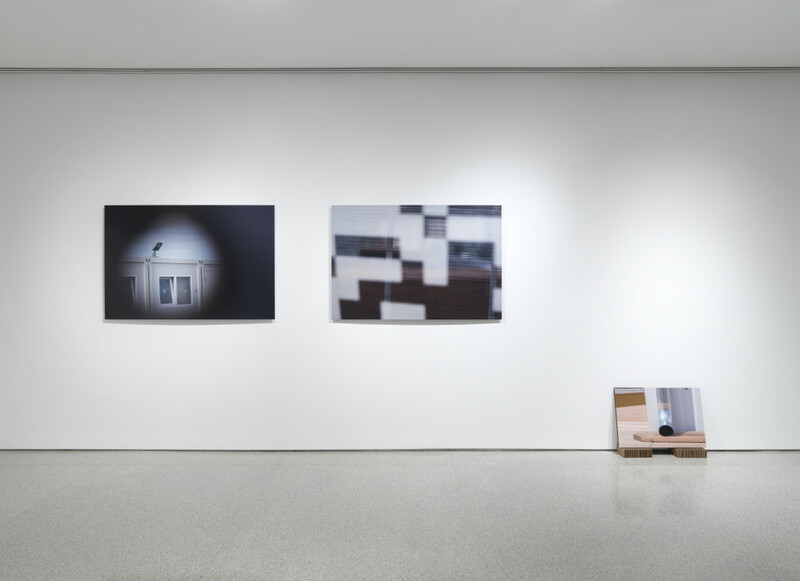 With exact dimensions of such a small living space, Rothenberg urges one to think about the consequences of immigration and adaption to the conditions of the new ‘safe haven.’ How does one adjust to the transitory circumstances? When does this transition turn into a permanent home? And more importantly, what does it mean to live in a space that is designed and certified for shipping? In the title ISO 6346: ineluctable immigrant, ISO 6346 refers to the international standard for identification and marking of shipping containers. As if there is a customary way of immigration for all people in the world, Rothenberg hints to the fixed norms of global world and its consequences in life. Considering the vast geographical and cultural difference of these refugees come from, the artist encourages to question, how one is expected to fit into the global standards designated for them. In one part of the exhibition space, Rothenberg builds a wall, similar to the walls of the containers used for housing. She places images from the archives with distorted photographs from the Tempelhof settlement. One document—an image, with big red bold letters, reads NEW CITIZENS, and behind that text vertically set are the colors, types of garments, and sizes in German. The document is designed to adjust the ‘new citizens’ to the foreign environment and provide the standards for them. Yet, is it easy to adjust to a new language, culture, measurement systems, education, etc.? As the famously quoted Charlemagne sentence indicates, “to have another language is to possess a second soul.” However, how does this new soul interact with our old one and affect our personality? What if the new soul digests the old one and erases of all our memories that belonged to our homeland, childhood, friends? What if adjusting to the new standards turns into a mere assimilation? What if we no longer like our grandmother’s vegetable soup, the poems we read in our native language, the tunes of our favorite song? Leaving the exhibition at Spertus, skillfully curated by Ionit Behar, I cannot stop relating the works of Rothenberg to my own history of migrations and exiles. Perhaps this is why; Rothenberg’s installations are never fixed to one idea or statement. Her work is rather speculative and relational, with a number of layers to decipher. Her exhibition at the Spertus is one of the finest examples of her approach to politics of everyday life and how she approaches communities. It is hard to read her work as a finished project because it is open-ended, porous, and continuous with questions that inspire us to pose and seek answers in our everyday life practices. ISO 6346: ineluctable immigrant runs at the Spertus Institute for Jewish Learning and Leadership until April 22, 2018. Taken from the interview with Ellen Rothenberg, by Ionit Behar, exhibition organizer, and Spertus Institute’s Curator of Collections and Exhibitions. 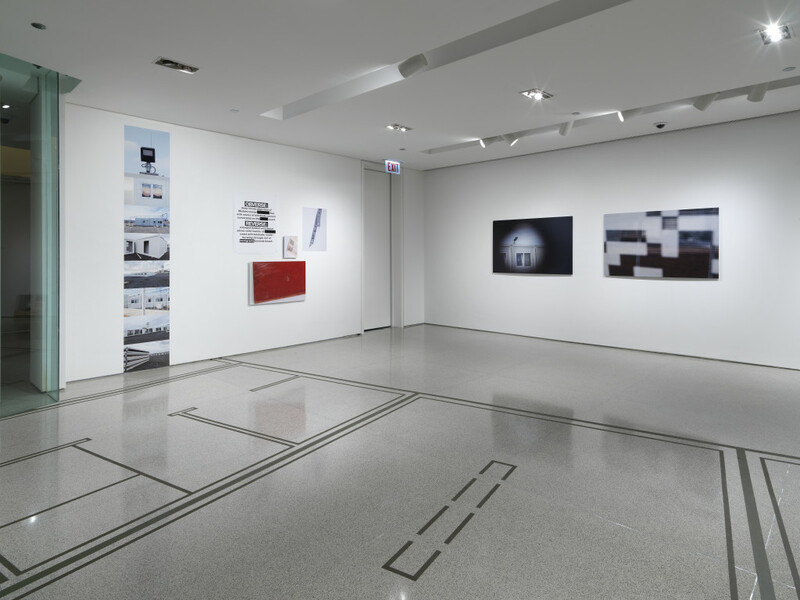 March 2, 2018 | Filed under Art Seen: Chicago and tagged with Ellen Rothenberg, Ionit Behar, Pinar Üner Yilmaz, Spertus Institute.